Elixir® Strings, the leading innovator in coated guitar string technology, announces a new addition to their lineup of electric guitar strings. OPTIWEB Coating is a new, innovative lightweight coating that sounds indistinguishable from uncoated strings*, but with the long lasting tone life of Elixir Strings. NAMM, Anaheim, CA – Elixir® Strings, the leading innovator in coated guitar string technology, announces a new addition to their lineup of electric guitar strings. OPTIWEB Coating is a new, innovative lightweight coating that sounds indistinguishable from uncoated strings*, but with the long lasting tone life of Elixir Strings. Uncoated strings are popular for their crisp tone, natural feel and playable grip, which come at the expense of tone life. Dirt, sweat, oils and air can quickly drain the life from a guitar string, making more frequent changes necessary, which can be both inconvenient and costly. The key innovation behind the OPTIWEB Coating is a proprietary process that produces a lightweight coating, which not only protects the string from the elements for longer tone life, but also allows the string to vibrate with less damping – for a crisp tone with a firm, natural grip, putting you in control of bends, vibrato and sustain. 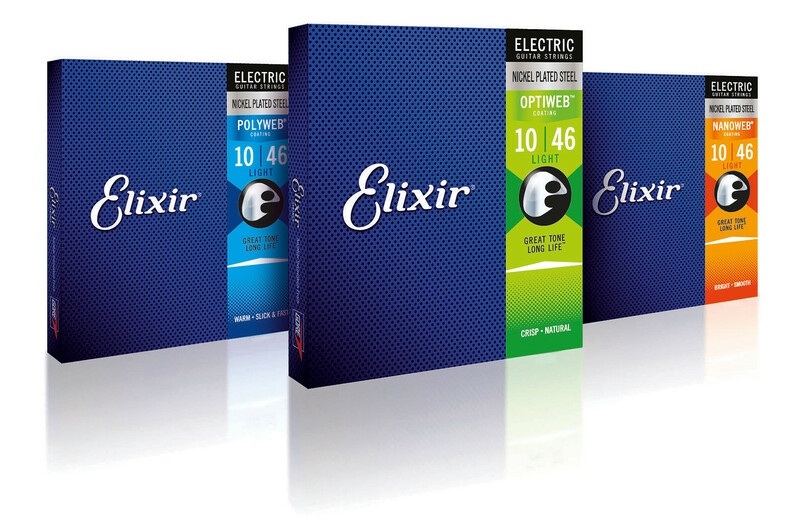 Guitarists have reported that they could not tell the difference in the sound of OPTIWEB Coated strings compared to uncoated strings during play-testing, which was confirmed by A/B sound testing in the studio: www.elixirstrings.com/experience. OPTIWEB Coating joins the Elixir Strings family of electric guitar strings and brings a wider choice of coating options to compliment every guitarist’s desired tone and feel. You may prefer the original POLYWEB® Coating, with a warm tone and slick feel, or NANOWEB® Coating, with a bright tone and smooth feel. All three coatings offer the renowned tone life of Elixir Strings. 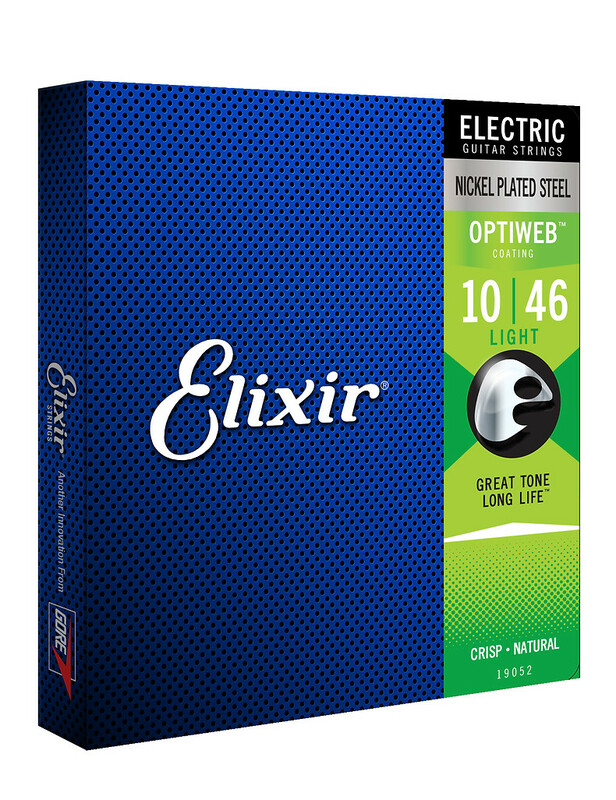 Elixir Electric Strings with OPTIWEB Coating are available in Super Light (9-42), Custom Light (9-46), Light (10-46), Light/Heavy (10-52), and Medium (11-49) gauge sets at authorized dealers. *Elixir Strings electric tone and feel field trials. Elixir Strings, the pioneer in coated string technology, is the only brand to coat the entire string. Both the outer string and the gaps between the windings are protected from debris that builds up, contaminating strings and killing tone. Elixir Strings are available in a full range of gauges for acoustic, electric and bass guitars, banjo and mandolin. Today, Elixir Strings are installed as original equipment by a growing list of discerning electric guitar and bass manufacturers, including Ibanez, Tom Anderson Guitarworks, iGuitar, Carvin, Melancon, Neville, ESP, Palir, Manson, Buscarino and Bacchus Guitars. Elixir Strings are manufactured by W. L. Gore & Associates, Inc., which has made its name by creating innovative, technology-driven solutions, from medical devices that treat aneurysms to high-performance GORE-TEX® fabrics. A privately held company with annual sales of more than $3 billion, Gore is committed to perpetuating its 50-plus year tradition of product innovation. Learn more at www.gore.com.